According to a new market report published by Transparency Market Research titled “Industrial Gas Turbine Ignition System Market – Global Industry Analysis, Size, Share, Growth, Trends, and Forecast, 2018 - 2026,” the global industrial gas turbine ignition system market is expected to reach a value of US$ 2,454 Mn by 2026. In terms of value, the market is estimated to expand at a CAGR of 9.6% during the forecast period from 2018 to 2026. In terms of volume, the market stood at around 534 thousand units in 2016. The Asia Pacific industrial gas turbine ignition system market is projected to have the highest growth during the forecast period. The market witnessed considerable growth due to increased demand for gas turbines in diverse applications. The industrial gas turbine ignition system market is influenced by market dynamics with the prime driving factor of increasing gas-fired power generation especially in developing countries. Out of the global installations of gas turbines in Japan, Russia, Taiwan, etc., Japan stands at first position in terms of largest number of installations. Rise of industrial gas turbine ignition systems is also impacted by the increasing demand for electricity across diverse applications. On the other hand, one of the main challenging factors affecting this industry is the continuous price war among industrial gas turbine ignition system players. 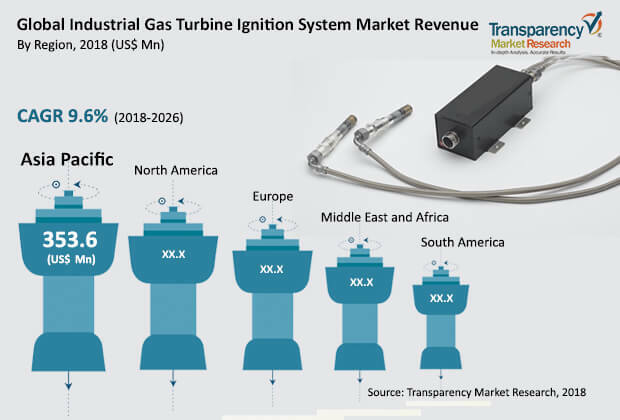 The industrial gas turbine ignition system market is expected to provide opportunity to players who are catering to those gas turbines which use micro turbine technologies. In 2017, based on component, the spark plug segment accounted for market value of about US$ 142.3 Mn in the global industrial gas turbine ignition system market. This is because of frequent replacements across diverse industrial gas turbine applications. Based on gas turbine type, light-duty gas turbine segment is expected to expand at the highest CAGR of about 9.6% in terms of value due to diverse new applications coming up for small and medium scale turbines. Additionally, transportation pipeline networks consisting of gathering system uses low pressure and small diameter pipelines. Aeroderivative gas turbines using various combined-cycle operations are seeing enhanced installations across the globe. Furthermore, in terms of application, the power generation segment is expected to hold the highest market share during the forecast period. This is because increasing efficiency and durability of gas turbines is expected across energy production. By geography, Asia Pacific region is expected to continue its dominant share in the industrial gas turbine ignition system market with more than 30% market share during the forecast period. Across the Asia Pacific region, China held more than 58% market share in 2017 in the industrial gas turbine ignition system market. TMR understands that the improved type of gas turbine installed base across the globe calls for appropriate quality ignition systems in the industrial space. Additionally, the improving natural gas industry is enabling the increasing installations of gas turbines as part of cheap alternatives. Companies are improving on base load electricity generation from natural gas. Moreover, there is a positive impact expected in gas turbine sales as shale gas is expected to see potential growth. The global gas turbine installed capacity especially in developed regions such as North America and Europe reflects the aging existing infrastructure, and accordingly replacements are expected to happen in future. The industry in these regions is supporting more of light-duty turbines, indirectly impacting positively the volume sales of ignition systems. The top companies considered while studying this report for the global industrial gas turbine ignition system market are Woodward, Inc., Unison, LLC, Champion Aerospace, Inc., Knite, Inc., Hatraco Technische Handelsonderneming B.V., Chentronics, LLC, Federal-Mogul LLC, Tesi Group, Meggitt PLC and Hoerbiger Holding. The industrial gas turbine ignition system market is segmented as below.